Pádraig’s Walk for Life is getting quite a bit of coverage. This morning, Pádraig Schäler (27), his family, friends and local well wishers … A promising swimmer, Pádraig Schäler had just completed a degree in . BREWSTER — On June 27, 2013, 23-year-old Padraig Schaler hopped on his bicycle and pedaled toward the Bramble Inn on Route 6A. Just as he . The journal.ie’s Instagram coverage from Monday, Tuesday, and Wednesday. 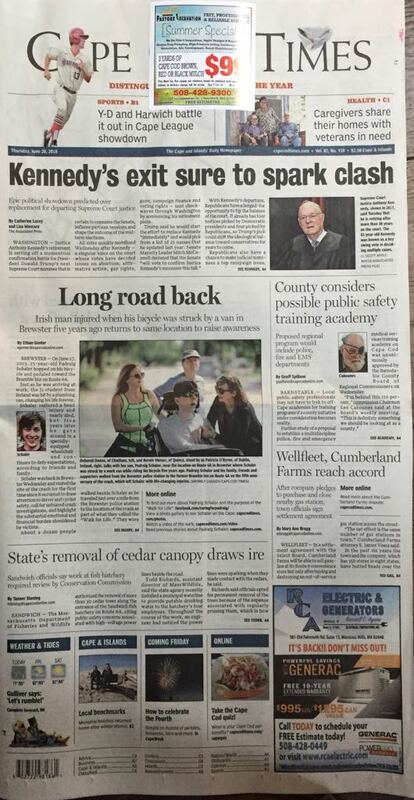 Pádraig even hit the front page of the Cape Cod Times! In addition, there were hundreds of tweets, shares, and likes from people Pádraig has touched, not all of them met. There were also many people who made generous donations via PayPal and GoFundMe for Caring for Pádraig, set up by a group of friends to raise funding for Pádraig’s therapies and associated costs. To all of the people who supported Pádraig’s Walk for Life, to raise awareness and to push for justice, who supported him in so many different ways: from the preparation of posters to organising a fantastic breakfast for all walkers, to spending time with him during his walk: Thank You!